The fifth Monday of every month is a second chance at Challenger’s Choice at Lens and Pen by Sally’s Phoneography Challenge and today I choose Architecture. 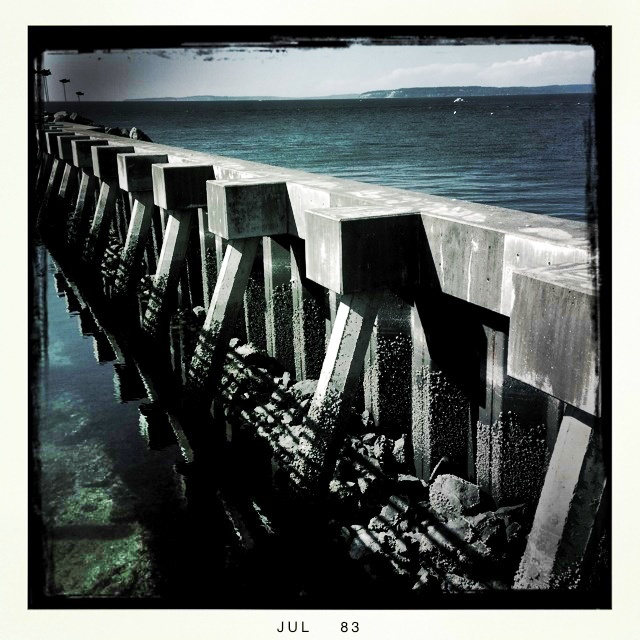 This is a small part of the breakwater at the Edmonds Marina taken from the walkway leading to the fishing pier. I like the angle and composition. Happy Phoneography Monday. Thanks Sally. 🙂 Happy Monday! I like everything about this photo. Thanks for your nice comment Janet. It is a simple photo with what I thought was some good color and strong lines but I wasn’t sure if it would be as popular as my past Monday choices. I decided to post it anyway because I like it and I’m happy to hear you do to! As usual, I like the processing, and the color! I’m glad you like it! This is another photo shot in Hipstamatic, then sharpened a little with Snapseed.